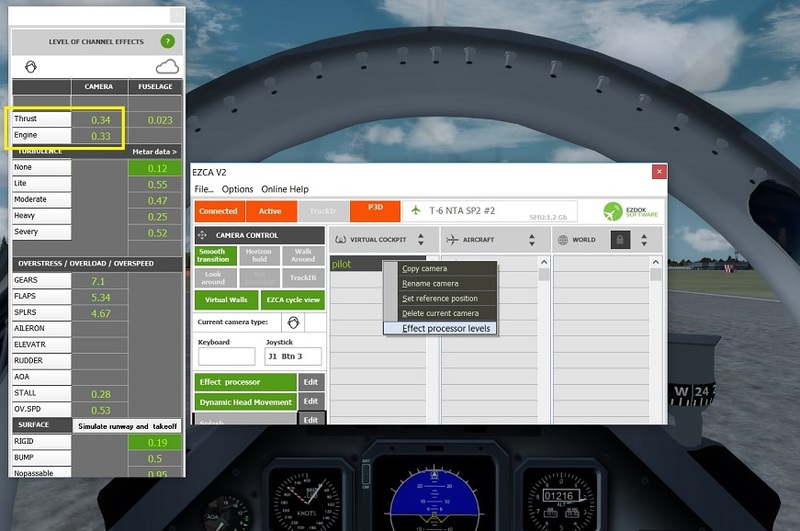 Autoenable on takeoff or when airborne (might start the flight up in the sky) makes sense. The arrows next to the KPH at the bottom in the video. They aren't needed, are they? My screenshot is in page 2 of this thread. The next time I get only a single beep and it isn't working. Updating the camera set after the first edit doesn't change the behaviour for me. My previous camera key is assigned to "Shift+A" and works fine on the keyboard ("A" is next camera). On the Logitech G13 it isn't working - the view just jumps to the previous one and then returns (i.e. goes to the next one). Seems EZCA parses the "A" again - it happens also when I change the assignment to "Ctrl+A". Doesn't matter if I add delays to the buttons. As view shortcuts (e.g. "CTRL+1") an the G13 work fine, I think there might be a problem with G13 and how EZCA handles the 'key presses'. It probably is my setup, as other users have P3D v3 running fine - but I don't know what it is. Hello, thank you for the update and thanks for offering old customers the ability to get your new product for a (great) discount. Had no problems at all with installation from the Flight1 package. All I needed was the order number from my first purchase. I had the issue with the middle mouse button. I use a Microsoft Keyboard / Mouse set and the trick was to change assignments from Microsoft Keyboard and Mouse Center. My choice was to set Wheel Button to "Middle Click" from the options available. One issue that I have not yet managed to tackle is this: Whenever you seem to get into edit mode, the Hat Switch of my Saitek X52 (which is used as a pan camera) stops working. I have to restart the app (from the file menu) and then all functionality comes back. Same applies when trying to play with sensitivities from general settings. I use Windows 10 64bit and FSX Boxed edition. Thanks for your efforts and happy new year. Is that possible with V2? Hi, how can I reduce the little trembles/jitter in VC and how can I add forward and backwards movement when I give throttle and brake? I bought the first version several years ago, and following your instructions I tried to download the coupon to get the discount, but not is valid. I was told to contact you! Yeah, that would be nice to know. Can anyone help. I've purchased and downloaded version 2. When i download it geives me an error saying either my password/email is incorrect (although it is because im logged in) or version 2 is not associated with my account (which it should because the confirmation email says it is). I also tried installing using the key but i do not know where to get the password from. I've used my acct password and the order number. Nothing works. I also tried using admin and that didn't work. I'm not going to pay $12.00 to purchase again. I've already paid. Can anyone please help because now it has locked me out of my Flight1 acct. No telling how long it will take before I can get back into that now. I'm tempted to just ask for a refund. This should not be this difficult. Sorry for the frustration but I've been deal with EZDOK problems since version 1.16 but yet i still continue to use it. That should let you know that when it works I like it and support the developer but I'm starting to get fed up. If i can't get this resolved I'll get my refund and move on to Chaseplane. Where is the list of new features for v2? Can't purchase something if I don't know anything about it. Same problem with edit mode. sometimes zoom on scroll wheel doesn't work. Does anyone have profile for any A2A Ga airplanes? Tried the baron profile at the web site but the yaw motion makes the single engine airplane feel like a twin. Thanks very much for this excellent update, and for the huge discount for 1.x previous users. The installation ok, no problems. After spending 15 minutes watching the youtube documentation, all is working perfecty. Only tested with two aircrafts, but all ok.
People this thread is out of control !!! Marniftarr - Thanks for your advice - I didn't realise these extra videos existed, they are very helpful! Horizon hold works beautifully, great work! 1) Somehow the camera transitions are jerky. You can see it in this video: https://www.youtube.com/watch?v=diNyG89VvKs. As you can see, panning with mouse and TrackIR is 100% smooth, but when a camera transition occurs is is quite jerky (like low framerate). 2) I sometimes can't edit a cam position. See this video https://youtu.be/djkJUb_yF0k. It's difficult to show on video as you cannot see my keyboard, but pressing NUM 2 does not "save" the position (instead the first "ding" noise that signifies entering edit mode is played upon pressing NUM 2). I believe I'm doing it correctly as sometimes it works, and others it doesn't. I'll continue testing and playing with EZDok V2 :).